It was on the 29th of October when I arrived Dapitan. The heavy rains pour the entire City where I did my post birthday celebration. I don’t even gave a care about the drops falling from the skies. All I wanted to do is to explore the entire City and here is my first spot. “The José Rizal Memorial Protected Landscape, also known as the Rizal Park and Shrine. The 16-hectare (40-acre) estate in Talisay was purchased by Rizal for P4,000 after winning the Reales Loterías Españolas de Filipinas (English: Royal Spanish Lottery of the Philippines) two months after arriving in Dapitan. Rizal built houses in the site, started a farm, put up a school for boys, and built a hospital where he could practice medicine and treat the poor for free. For four years, he worked as a rural physician, farmer, merchant, inventor, painter, sculptor, archaeologist, linguist, teacher, architect, poet, biologist and environmentalist. His mother, Teodora Alonso, sisters and other relatives would later on come to live with him in the farm. In 1897, after Rizal was executed, these properties were confiscated by the Spanish colonial government as indemnity to the state and transferred to the custody of Don Cosme Borromeo. The site was then converted into a public park in 1913 with the structures built by Rizal reconstructed on their original sites. Inside this Museu ni Rizal. I was able to learned few things about the personal life of Dr. Jose Rizal that was not discussed by my teachers when I was in Grade school and secondary. I saw some personal stuffs of Dr. Jose Rizal and I was amazed that they were able to preserved it. Dr. Jose Rizal hobbies are Horse back-riding , writing and fishing. The protected landscape area contains the Rizal National Shrine, declared in 1973 through Presidential Decree No. 105. It is a collection of five reconstructed houses of bamboo and nipa originally built by José Rizal. After a few minutes of discovering what’s inside the Musue of Rizal. I jaunted the 40 acre Rizal Shrine where it really take time to roam around. Inside the shrine you will be able to see the 5 historical reconstructed houses. The Round House. An octagonal stilt house that served as the quarters of Rizal’s students and a clinic. The Square House. Located at the base of a hill, it served as a workshop and secondary dormitory for Rizal’s students. Casa Residencia: The main house and also the biggest. It served as Rizal’s residence where his mother and sisters also stayed during their visit. It has one bedroom and a surrounding veranda with views of the Dapitan Bay. Inside, a replica of Rizal’s bed can be seen and a simple comfort room connected by wooden planks is found at the rear. It also houses Rizal’s family kitchen, which is a little lower than the main house. Inside this biggest house of Rizal Shrine. I was in love with the scents of the bamboos. Also, I ended up with a personal thought ” This house can really give you a peace of mind”. I imagined the happiness of Rizal when he was here. The fact, that they stayed here with her mother and sister. This is the small rounded house where Rizal took care of his poultry. Aside from the house you will be able to see a heart- shaped rock use to be known as the “Batong Lumayag” or sailing stone. Because it appeared as floating or sailing during high tide. It was also here where he spent many hours watching the sunset. This was also the site where he and Josephine Bracken exchanged vows and lived as husband and wife after the consent of his mother. This spot is the point in Dapitan generally considered as the arrival site of Rizal. According to historical accounts, Rizal arrived here at even o’clock in the evening of July 17, 1892 onboard a vessel called SS Cebu. This ship was manned by captain Delgras and 3 artillery men. With combat lights, they made their way to the nearby Casa Real through Sta. Cruz street. After Casa Real. Manong Julio wants me to end my historical tour to the church where Jose Rizal used to heard mass every Sunday during his exile. On this spot of St. James Church constructed by the Jesuits in 1871, Jose Rizal stood while hearing mass every Sunday. Church of St. James- Dapitan. Originally constructed in 1871. The wall of the church was made of galvanized iron and it was replaced with the present solid masonry in 1904. My historical tour in Dapitan is like following the foot trails of Rizal, from his arrival in the City up to his last settlement in Barangay Talisay, which is now called the “Rizal Shrine”. Special thanks to LaiAriel Samangka of jauntingandmusing.com, Villa Pilar Inn, City Tourism office of Dapitan and to Manong Julio for making this historical travel possible. More about this Nhagzventures in Dapitan soon. You can also make suggestions by posting comments about this post. Reading your blog posts made me want to travel and see more places. I hope you keep it up and may we all travel together in the near future. Heard about the place but not that much. Looking at the photos maka ingon ko daghan diay stories aning lugara. I like the wall details and mga old papers and even clothes ni Rizal nga gi preserve. Wow lang!! I feel like I went back in time reading this. I also remembered my first ever stage performance as Jose Rizal back in grade school where I had to recite “Mi Ultimo Adios” in Filipino. Truly a magnificent hero – someone to look up to. That time when Php 4,000 can make you a haciendero! Hahahaha! Grabe na ang inflation sah? I love his bamboo huts! Super nice! I can imagine the smell of the bamboos too! I’ve always wondered what is inside Rizal’s Shrine. I think there needs to be more exposure here. Thanks for this, Nhagz! I now have one place to go to if ever I’m in Dapitan city. Haven’t really explored that part on the Philippines tho. Thanks for this. I’m a big fan of places that have a lot of history and culture behind them. Would definitely be cool to visit a place such as this, specially with the amount of rich history behind Rizal’s life. He’s always been a really interesting person and it’s a good thing to learn more about his life and pretty much what made him worthy to be titled our national hero. Planning to visit Dapitan and will definitely check this shrine if time permits. Will bookmark your post as a guide.Thanks for this. Rizal has lots of memories everyone. I hope he’s happy wherever he is right now. Kidding aside, we should have more than one national hero. Yes, the trip looks exciting! Wala pa ko kaanha dira. When I was taking Rizal class in college, I got really hooked and wanted to learn more about his life. He is a really awesome Filipino and I love that he knows so many languages. Loved reading his diary, too. HIs shrine in Dapitan is definitely high at the top of my bucketlist. Hi. Pam. Me too I loved the story of Rizal. When I was a student if our topic in History subject is all about Rizal. My eyes and ears are fully attentive to my teacher. 🙂 That’s why I had a great time jaunting Rizal Shrine. 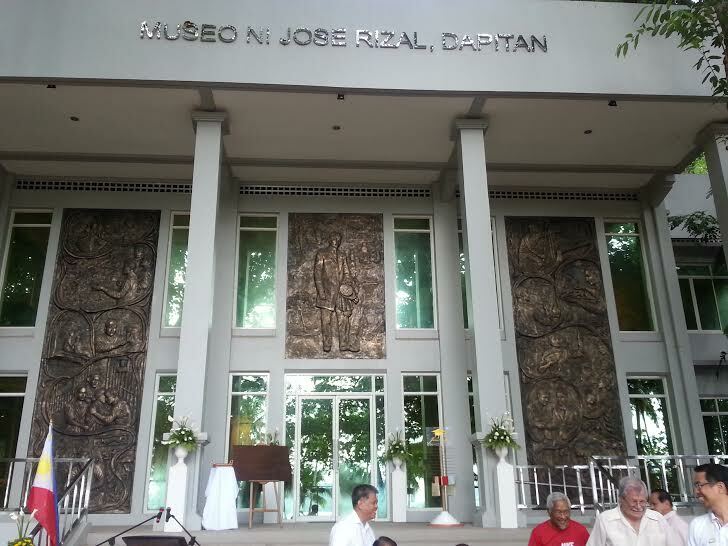 I knew Rizal was exiled in Dapital and I did not know that there’s a musuem! Also able to preserve artifacts of his clothes and scriptings. Great! That’s my hometown! Hehe! I’ve been with these places countless times but I still want to come back whenever I have the time to do so. Did you catch Dapitan’s sunset? I’ve never been fond of History and Rizal’s life has never been appearing to be interesting to me since then, but everything was altered when I visited this place 2 years ago and finally I have appreciated all his efforts and help he had offered to all the Filipinos.